During the late 19th century and early 20th century Walney was seen as a possible seaside resort with hotels and attractions. In 1877 Biggar Bank was leased by the Corporation of Barrow-in-Furness for use by the people of the growing town. Four years later, the Corporation bought the Bank. In 1898 Ben Fish, the mayor, announced plans to form a company to supervise two developments on Walney: a seaside resort near Earnse Point and a workers’ housing estate on the east of the island. Walney-on-Sea was to have a steamship service to the Isle of Man and North Wales. 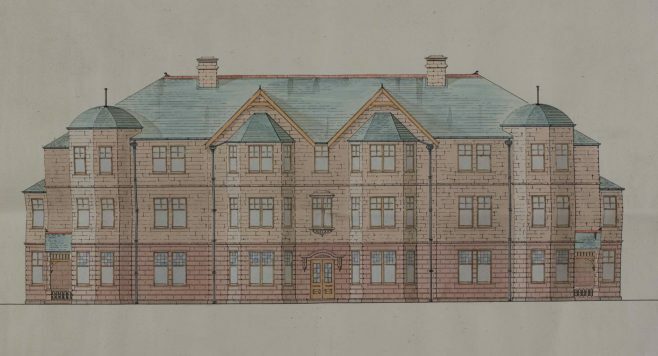 The workers’ housing was built by Vickers but Walney-on-Sea did not materialise. 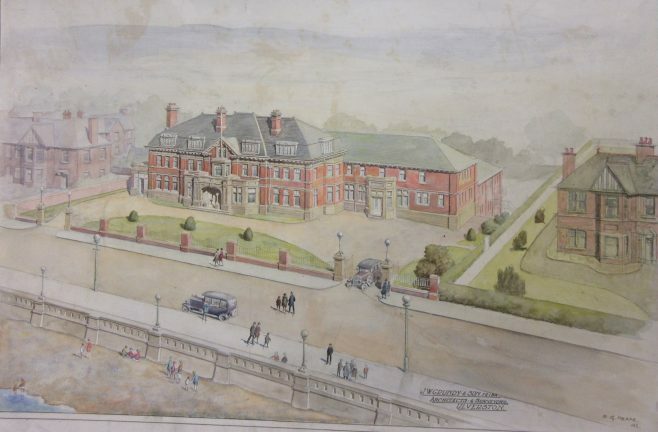 In 1929 J W Grundy and Sons, architects of Ulverston, drew up plans for a Grand Hotel as shown in the painting below. The plans included a ballroom with orchestra pit. The hotel was never built. In 1924 Dr Booth suggested that the Bankfield Hotel at North Scale could be turned into a hotel where customers could benefit from immersion in salt baths as in Droitwich. Rather than drinking the water as at Bath, muscular relief was derived from swimming and floating in a dense, concentrated salt solution. 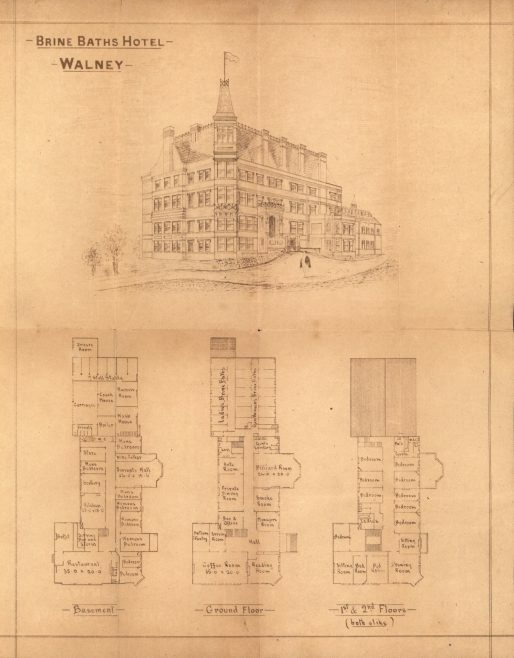 The hotel was to be very grand and extensive as shown in this plan and elevation but it was never built. There is year by year a greater demand for first rate seaside links on account of the increased number of players, many of whom desire to visit links at a distance from their home course where they can combine the attractions of golf with a seaside resort. The necessary stretch of land, however, with a combination of proper length, breadth, turf and bunkers, sea, sand, shore, boating and fishing is not easy to be procured…After long search and consideration I have found what appears to me a solution. 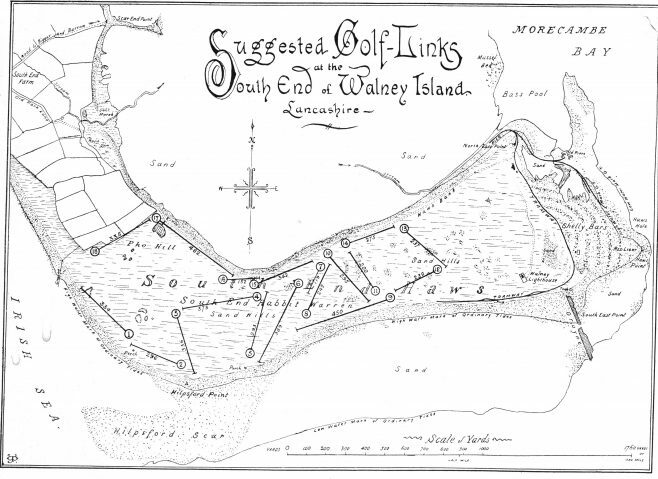 The writer points out to the reader that the land at the South End of Walney would be perfect for a golf course and was easily accessible compared with other courses in Scotland. The golf course was never built. Amongst the many plans from Barrow Borough Council housed in Barrow Archives, is this one showing proposed dancing and concert halls for Biggar Bank. The hall would hold 2000 people. Unfortunately the plans are not dated but are likely to be from before the First World War. The halls were never built. Plan of proposed dancing and concert halls for Biggar Bank. This article is based on an exhibition created by Cumbria Archive and Local Studies Centre, Barrow-in-Furness.